« One Year Out: Where Do Canadians Stand? [Ottawa – October 23, 2016] The most ubiquitous transformation of our society has been the digital revolution. Whether this has had a net beneficial impact on standard of living or democratic health is unclear. It is the case that this third industrial revolution has occurred contemporaneously to a period of economic stagnation and a declining trust in government and democracy. What is clear is that the internet is the new universal mass media and that nearly everyone is online daily. Increasingly we do our shopping online, we bank online, and we access entertainment and news online. Which leaves the glaring question of why we don’t do our voting online? In an era of WikiLeaks and pervasive hacking, there are legitimate concerns about privacy and security. There are also legitimate concerns with some issues around a paper ballot. If we can make financial transactions secure, surely the advent of block chain and related technology will render online voting as safe as the veteran polling station model. We aren’t here to debate that question. We are here to say that the introduction of an online voting system would have an extremely positive impact on the health of democracy. We also contend that there is zero question as to whether this will happen in the future; the bricks and mortar polling station has roughly the same shelf life as whips and buggies did at the outset of the 20th century. If we built an online voting system, it would almost certainly immediately be the most popular means of voting. By an increasing margin, the clear majority of Canadians say they would be very likely to use that option. We would predict that if this were to be implemented by the next election, then by the following election, there would be no traditional polling stations. If we think about the controversy about “rigged elections” being raised by Donald Trump, and the frightening idea that his supporters should “monitor” voting booths, we can see a further benefit of voting online. What is truly remarkable about this growing consensus is the conspicuous absence of fault lines that we would have seen in the past. Older and younger voters are equally enthusiastic. There are no major differences across party support or any other demographic characteristics. This debate does not have the glaring partisan faultiness we see around the debate about moving away from the first-past-the-post-system. It would be a non-controversial and worthwhile reform that would avoid the partisan quagmire plaguing other parts of this debate. How would the world be better if this were to occur? First, it would be almost certain that voting rates would rise. The challenge of trudging through inclement weather or waiting in lines would be eliminated. It is undoubtedly the ease of this that would bolster participation rates (more so for those with special access issues) and would eliminate the need for plane tickets for some indigenous communities to vote. Although there would be significant investments going in, there is little doubt that a digital voting world would cost less to maintain than the current system. The speed and precision of the outcomes would also be enhanced. Another benefit might be that if digital infrastructure existed it might be used more frequently between elections for plebiscites or referenda. Our evidence suggests the citizenry do not want to simply have a kick at the can every four years. 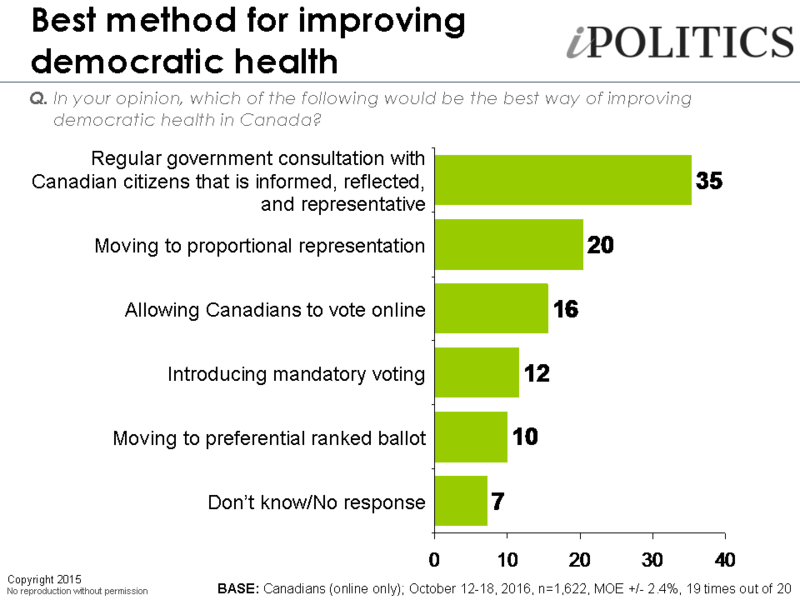 What is interesting about the debate about electoral reform is that the public don’t really see any single solution to the democratic malaise which exists today. Noting that there have been significant improvements in trust and legitimacy these are do not dampen the desire for a better democracy. The public provide a pretty compelling recipe for improving democracy. Putting aside the surprising finding that routine citizen engagement would be seen as the best step forward, the recipe would also include proportional representation and voting online (and quite possibly mandatory voting). The case for online voting is stronger amongst younger voters (who have been voting less than in the past). Within the current debate about democratic renewal there is no doubt that we should be providing an online ballot sooner rather than later. While panellists are randomly recruited, this survey was conducted online only, meaning that it excludes the roughly one in six Canadians who either can not or will not respond to surveys online. Results should therefore be considered representative of Canada’s online population. The field dates for this survey are October 12-18, 2016. In total, a random sample of 1,622 Canadian adults aged 18 and over responded to the survey. The margin of error associated with the total sample is +/- 2.4 percentage points, 19 times out of 20. If you build it, they will hack. * Widespread use of online voting would enable widespread coercion of voters, including vote buying. * The innumerable software and hardware components that would be involved in marking, transmitting, receiving and counting an online ballot represent an unreasonably high risk to the chain-of-custody for the ballot. * Canadian government departments have already been successfully cyberattacked by nation-states. * Computer security experts warn that online voting is not secure. * National security experts warn that online voting is not secure. * Social science evidence indicates that online voting won’t increase turnout. Let’s take turnout evidence first. Just last week there was online voting again in Halifax. Similarly, on the security front, the article proceeds from one assumption unsupported by evidence to another. First “If we can make financial transactions secure”. Well actually we can’t make financial transactions secure. The core interbanking system SWIFT was compromised and millions of dollars were stolen. Online banking transactions are individually identifiable and reversible. That’s why online banking works. When people’s banking accounts are hacked – and they are hacked all the time – the charges are reversed by the bank at no cost to the customer. Votes can’t be either individually identifiable or reversible. That’s one of the core challenges of online voting. And it’s important to understand hacking isn’t some theoretical threat. Core internet services were disrupted just this past week by a Distributed Denial of Service (DDoS) attack. Online polls where you ask people whether they like doing things online are all well and good. But they’re not evidence supporting policy on online voting. When the actual evidence is examined, the conclusion is that online voting is a terrible idea.